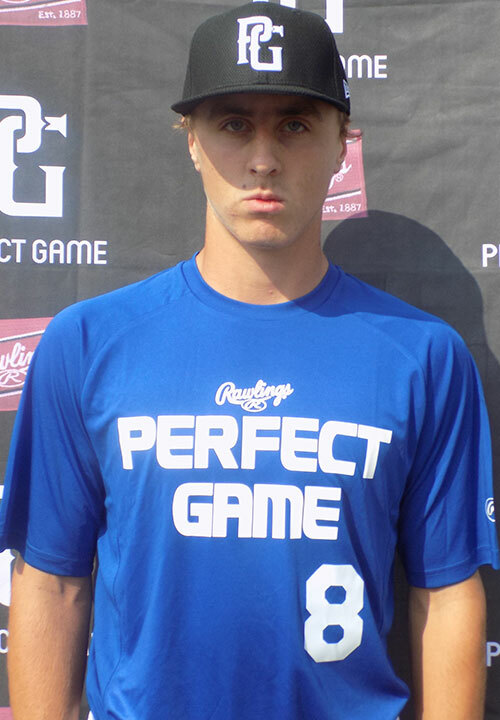 Ryan Hyde is a 2019 C/OF with a 6-1 175 lb. frame from Berlin, CT who attends Berlin. Medium frame with projectable, athletic build. Ran 60 yard dash in 7.37 seconds. Showed very well with the bat, real bat speed, shifts well into contact and gets lower half involved, middle-field approach, good leverage off of front side when on time, gets barrel out well, has strength, drove the ball well and projects for serious pop. Worked out behind the plate, stationary set, explodes out of crouch well but doesn't gain significant ground, quick transfer and release with quality arm strength, clocked up to 75 mph. Also pitched and looked good, deceptive tempo, athleticism throughout delivery, fastball worked 83-84 mph and pounded the bottom of the zone with it, good plane to plate, showed solid curveball with good spin but varying shape, lots of strikes. Named to 2018 Northeast Showcase Top Prospect List, very good student.